Our must try easy keto instant pot recipes that will cover all your meals from breakfast and brunch to soups, lunch, dinner and decadent desserts. I often hear – “I can’t follow a low carb or keto lifestyle because it is too expensive or too much work and it takes too long to prepare meals”. I agree, you need to plan your meals and it is helpful to batch cook on weekends. This is what I do most of the time and I shared my lunch prepping ideas here. We don’t always have the time. So, I was not surprised when I saw how many keto instant pot recipe books have been published in recent times. Then check out this post, where I discuss a few of these keto pressure cooker cookbooks and also what to look out for when you buy kindle recipe books. Now, I know I tend to talk a lot - if you just want to check out the pressure cooker meals on this page scroll down or click here to go straight to the soups and broths or here to go to the lunch and dinner recipe. Then you may be wondering what else I have to say, besides the recipes I have promised you. If you have some questions about how to use your instant pot or how to convert traditional or crock pot recipes to pressure cooker recipes, then you’ll want to check out the amazing resources at Hip Pressure Cooking School. I assume if you are looking for instant pot keto recipes, you already own one and are looking for meal ideas. But if you don’t and you are wondering how to choose the best pressure cooker, you can read more here where you’ll also find out that my favorite is the Instant Pot Duo which you can see here at Amazon. And unless you have a really good reason to get a smaller pot, just go for the 8 quart size. Now, let’s get to the best keto instant pot recipes on the internet. I’ve separated them into breakfast and brunch. Then soups lunches and dinners and then desserts. These dishes are amazing, but if you are looking for anything I have missed, please let me know in the comments. If you need a quick breakfast before you leave home in the morning or like to have breakfast on the go, you’ll need to do some planning. One way is to batch cook on weekends with or without your instant pot. The other is to do some prep work at night and pre-set your instant pot to start cooking as soon as you need it to in the morning. If you open the fridge of most ketoers, the one cooked item you are always likely to find is hard boiled eggs. Not only are eggs a favorite for breakfast, but it is also a perfect anytime snack. My pet peeve with boiled eggs is losing some of the egg when I peel them. I don’t understand why some eggs peel with no problem and others just doesn’t want to play along. So what makes boiling eggs in an instant pot easy to peel? Jessica from Jay’s Baking me Crazy says that the reason they are easy to peel is that they are steamed and not boiled. She does say though, that it is best to peel them while they are still warm. She lets them cool down for 5 minutes and then peel them. Check out exactly how she makes them here. These bites are the perfect on the go keto breakfast and a good post-workout meal for those of you who like to work out in the morning before work. Brandi from Stay Snatched says that she used to regularly make egg white muffins in the oven, but found that they ended up a bit dried out and not evenly cooked. She likes a sous vide texture and in making these in an instant pot, she could achieve this texture. I like this keto breakfast casserole because we very much eat with our eyes and this is a beautiful and delicious dish which is perfect for brunch with you friends. This recipe was inspired by California breakfast burritos. 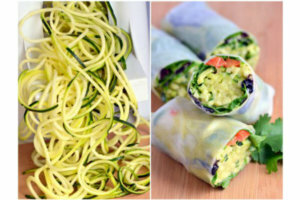 But instead of using hash browns or potatoes, Carolyn from AllDayIDreamAboutFood.com found a good use for shredded broccoli stalks. 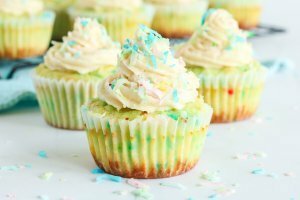 Get the recipe on her website and if you like her recipe books, don’t miss the launch of her new book – Easy Keto Desserts in July. Do you like light and fluffy eggs and frittatas? Then you should really consider making them in your pressure cooker. … and if you need recipes, Urvashi Pitre from Two Sleevers should be one of your “go to” recipe developers. You’ve probably seen her Instant Pot Cookbook on Amazon. If not, click on the image to check it out. This colorful and delicious keto broccoli ham and pepper frittata is another of those recipes that is perfect for when you want to entertain your friends with a delicious keto friendly brunch. It is made with eggs, ham, cheese, cream, red peppers and broccoli and has 7 grams of net carbs per portion. Looking for a non-egg Instant pot breakfast recipe? It takes about 15 minutes and is made with dried coconut, coconut flour, coconut milk, psyllium husk and water. It is flavored with vanilla, cinnamon, nutmeg, stevia and monkfruit. Usually when we think soup and broth, we think long hours in the kitchen. But you can cook your favorite ketogenic soup in a fraction of the time with your instant pot. Whether you have recently started a keto lifestyle or have been eating keto for a long time, you are probably very much aware of the benefits of bone broth. Many of us buy bone broth, because it takes a long time to make. You can also make your own within hours, if you know how. How can I use the words low carb and chowder in one sentence? Well, yeah normally chowder is made with potatoes and unfortunately potatoes are not low carb and is not keto friendly. Potatoes are not the only vegetable that we can use to make a chowder. This chowder is made with celeriac root and the creaminess is created with cauliflower. From start to finish you can have it on the table in 30 minutes. Oh yeah, this delicious rich creamy and fragrant chowder is also dairy free. This recipe was created by Lindsey from All the Nourishing Things. Get this recipe and many more nourishing recipes from her blog. Cabbage is my favorite veggie. It is versatile, cheap and low carb. And most of all - I like the taste. So, combine it with ground beef, beef broth, a little onion, tomato, amino acids and flavoring and the end result is a delicious, quick soup for any night of the week. It is low carb with less than 5 grams of net carbs per portion. This recipe is one of many delicious keto recipes you’ll find on Kasey’s blog – KasyTrenum.com. This delicious rich soup is the perfect keto meal on a cold evening. It has only 5 grams of net carbs, with 17 grams of protein and 40 grams of fat. If you are looking for a rich typical keto soup recipe then you’d want to check out this recipe with its heavy cream, cheese, broccoli and chicken broth. And best of all – you can whip it together in your instant pot in 20 minutes. To get this recipe and more, visit Taryn’s Joy Filled Kitchen. For many of us chicken soup is the remedy from our childhood that make us feel better when we suffer from a cold or flu. It is the perfect nourishing soup for all year round though. It is made with chicken of course and packed with lots of keto friendly veggies with cauliflower, broccoli, celery, zucchini, red peppers, mushrooms and beans. It is made with my favorite shirataki noodles. I love them, but I know they are not for everybody. If you are not sure about them, just give them a go in this soup. Make sure to rinse them well and enjoy the texture of noodles with fiber but no carbs. How else will you be able to enjoy a nourishing chicken noodle soup with less than 5 grams of net carbs per serving? This warm and comforting goodness is by Martina from Keto Diet Blog. Martina is one of my favorite keto cookbook authors. She published a book last year with keto slow cooker and one pot meals. Do you think stews and soups when you think pressure cooker recipes? I understand why, but you can really prepare any meal in your pressure cooker. To showcase the best low carb pressure cooker meals, I searched many websites and found lots of delicious keto instant pot dinners. I was looking for different cooking techniques and also specific hero ingredients. I decided to group them by the ingredient. So this section with keto mains start out with LCHF Chicken meals. Then there are a few low carb seafood and fish dishes, followed by lamb, pork and beef recipes. Making a tender, juicy rotisserie chicken in you instant pot can’t be simpler. It takes a little time, but is so simple to do and you’ll know exactly what spices and other ingredients were used in preparing the chicken. For step by step instructions and the recipe visit A Pinch of Healthy. What I like about this recipe is not just that it is low carb and flavorful and delicious, but that it is part of a training session on how to use your pressure cooker. Laura from Hip Pressure Cooking is a household name when it comes to developing recipes and teaching others how to use their pressure cookers to maximum effect. This recipe is part of section 5 in her course where she teaches how to braise food for maximum flavor. This chicken is cooked with a marinade consisting of cloves, rosemary, sage, parsley, salt, pepper, lemon juice, olive oil and water. It has less than 3 grams of net carbs per portion. ... and if, like me, you want to keep the fat grams higher, just keep the skin on. For the recipe and to learn everything you may want to know about how to use your pressure cooker, visit Hip Pressure Cooking. If you like the ideas of Buffalo chicken without the mess, then you’d want to give this recipe a go. It is made with ground chicken, almond meal and hot sauce as the main ingredients and has only 2 grams of net carbs per portion. Enjoy and get the recipe here at What Great Grandma Ate. I have been searching for keto friendly fish and seafood instant pot dishes, but wasn’t very successful. If you have a great recipe, please share them below. What I did find was a delicious Whole30 recipe for Gumbo that may be a little high in carbs, but you know that it is made with real good whole foods. The second is a low carb salmon recipe, that has honey in its dressing, but you can replace the honey with your sweetener of choice and end up with a divine keto friendly easy and quick to make salmon. Gumbo – Soup or Stew? Enjoy this delicious comforting rich meal either way. If you make it as a stew, serve it with cauliflower rice. The heroes in this gumbo are sea bass and shrimp. It is complimented with onions, bell peppers, celery and tomatoes. It is seasoned with Cajun seasoning and of course no super healthy soup or stew can be complete without bone broth. Want to see more, then check it out now. I like salmon, not only for its taste, but also because it is high in omega 3. I just seem to have a mental block when it comes to cooking it. I found these instructions by Julia from Savory Tooth, where she explains how she perfectly makes salmon in her instant pot in just 5 minutes. 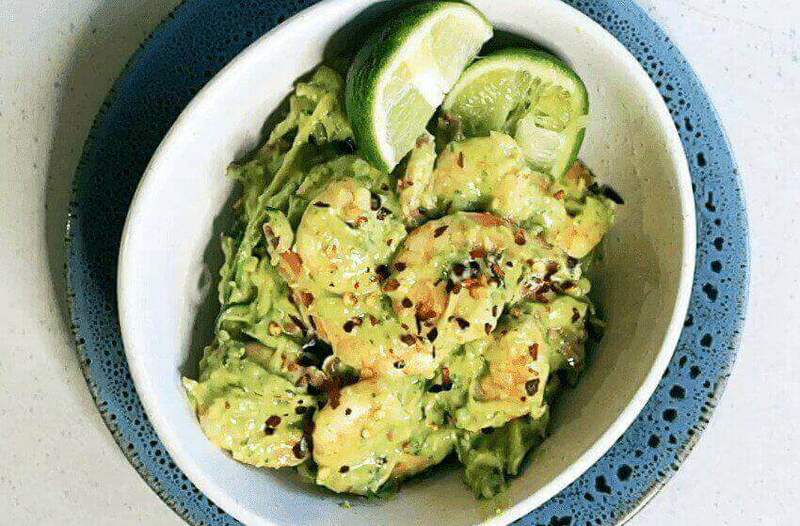 Check out how she does it and get the recipe of her chili lime sauce. If you want to lower the carbs in the dressing, use less honey or a sweetener of your choice. If you’ve followed Essential Keto for a while, you know that I am a big fan of one pot meals and this rich lamb stew tick all my “I have to have this” boxes. Set aside a few hours and cook this lamb shoulder. You can feed 15 with this recipe or cook it over the weekend so you have easy lunches and dinners during the week. Serve with sour cream and Parmesan cheese and you have a delicious low carb high fat dish with less than 2 grams of net carbs per portion. The recipe was developed by Gerri from MyKetoKitchen. Do you want a delicious dinner, but don’t want to heat your whole kitchen during the hot summer months? Then make these tasty and juicy smothered pork chops. What makes them special is the rich creamy mushroom sauce. Oh, and don’t worry, they have just more than 4 grams of net carbs each. Click on the image for the recipe and photo credit and step by step picture instructions. The first is Melissa with her Instant Pot. Since falling in love with her instant pot, Melissa from I Breath I’m Hungry has converted a number of her traditional low carb recipes into instant pot recipes. So, if you want to make pork ribs in your instant pot, then check out her step by step instructions to make them in less than an hour. The second is Sahil’s, which he cooks in his stove top pressure cooker and then finishes of in a wok. Sahil is my favorite keto YouTuber. If you have not watched the Headbanger in his kitchen, you are in for a treat. Watch him here prepare his ketogenic barbecue pork ribs and get the recipe for his ribs and for his keto barbecue sauce. I normally bake my lasagna in the oven, so was surprised when I found a lasagna instant pot recipe. But why not? There really is nothing we can’t make in our instant pots. This recipe was created by Lisa from Low Carb Yum by layering ground beef, cheese (ricotta, Parmesan and mozzarella) mixed with an egg and marinara sauce. You have to try it. Click here for the recipe. Make this chili in your instant pot in a bit more than half an hour. Or take your time and prepare it in your crock pot. Both methods are great and will result in a tasty meal. For this chili to be low carb, it is obviously made without beans. Get the recipe from Wholesome Yum and don’t miss the video where Maya shows how she makes it. When I was a child my mother used to make a lamb or beef roast for Sunday lunch. The meat normally went into the oven early Sunday morning or even into the slow oven on Saturday night. With this beef roast recipe from Denise of My Life Cookbook, I can recreate a Sunday roast in a bit more than an hour. And if you like garlic, then as we’d say, you are golden. If you prefer to make meals like these in your slow cooker, she has you covered too. Carolyn from All Day I Dream About Food says this is the creamiest cheesecake ever. She also says she can whip it up in a fraction of the time it would take her to bake a low carb pecan pie cheesecake the traditional way. It only has about 3.5 net carbs per portion. I still have to let it chill for three hours. But it is worth the wait, even for someone as impatient as me. Do you have 4.4 grams of net carbs to spare for this chocolate treat? This divine mousse recipe is from Denise at MyLifeCookBook.com. The recipe had its origin as pots de crème. In their low carb conversion they became more like chocolate mousse and so these single portion low carb instant pot chocolate mousse desserts were born. They are made with egg yolks, sweetener, cacao, water, cream, almond milk, vanilla and sea salt. Denise makes them either in ramekins or little 4 oz mason jars. Ouch, another dessert I have to wait for. They are quick to make, but need 4 hours to set, so if you’d like to make these for a special dessert make them the day before. Get the recipe at My Life Cookbook. This keto Thai custard is made in an instant pot by Urvashi from Two Sleevers. I like the custard texture and the green color that you’ll get from the pandan extract. It reminds me of a fridge tart my mother used to make. It is a simple diary-free recipe with only four ingredients – eggs, unsweetened coconut milk, sweetener and pandan extract. It has 6 grams of net carbs and your kids will enjoy it too. Make a delicious, decadent and creamy cheesecake with 5 ingredients in just 30 minutes. All you need is cream cheese, eggs, sweetener and vanilla extract for the cheesecake and strawberries for the topping. But, yeah it is a cheesecake, so you’ll have to wait a few hours for it to chill. Get the recipe from Jamie at Scattered Thoughts of a Crafty Mom. If you enjoy my keto roundup recipes, you’ll know that I never share more than two recipes from one recipe developer. Today I break my own rule with this the third recipe I share from Urvashi Pitre. If you like a simple moist cake, then you’d want to try this gluten free almond cake that she makes with almond flour and shredded coconut. It has only 3 grams of net carbs per slice and you can get the recipe here. 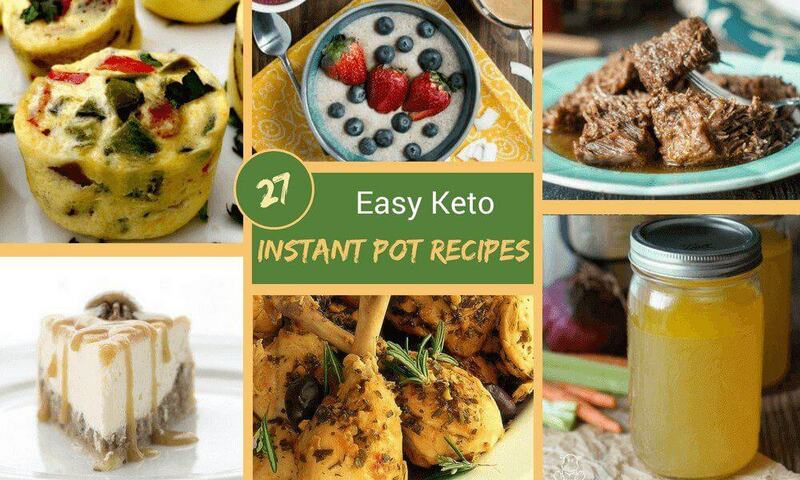 As I mentioned in this post – Keto Instant Pot Cookbooks, with the increasing popularity of the Instant Pot, many food bloggers are publishing books to share their amazing recipes with us. You can read more there or check out Urvashi’s book on Amazon by clicking on the book below. Yeah as instant as can be. You need about 30 minutes to prepare, cook these in the instant pot and wait for them to cool down. Watch how she makes them and then check out the recipe on YouTube under the video. If you are still reading, I trust you enjoyed our roundup and found some amazing dishes to try. Please leave a comment and tell us which of our low carb high fat instant pot recipes you have tried or will be making. The first is the convenience and speed. You can cook a gourmet meal in a fraction of the time making them really energy efficient. And they are really great on hot summer days as they don’t overwhelm your kitchen with heat as a normal oven would. Given that it is a relatively small appliance, it doesn’t take up a lot of kitchen space. Lastly, for someone following a keto diet to whom the quality of my food is really important, food prepared in the pot retains most of its nutrients. Urvashi Pitre’s keto cookbook is my most used cookbook! The shrimp, tomatoes, and feta is a family favorite. My eldest child and I love the butter chicken. The carnitas recipe I quadruple , because it’s the best carnitas and we can’t get enough! Seriously, get this cookbook!